The OpenLM Agent may be installed on any number of workstations to enhance the end-user experience and control. The goal is to allow individuals at workstations to obtain additional information about licenses which can be used to more effectively manage resources. The possibilities include but are not limited to: providing individual stations with the capability to monitoring of idle and potentially available licenses, reporting project information, and simplify starting, stopping or killing processes. This document covers only installation and removal of OpenLM Agent. There are three options for installation including using the standard Setup Wizard, silent installation, or with Microsoft System Center Configuration Manager. 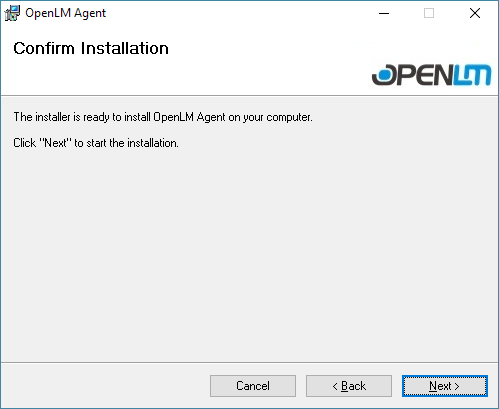 To begin working with OpenLM Agent, users need to initiate and configure the installation using the installation package openlm_active_agent_win_####.msi (“####” represents the version number). Installation can be handled with the standard Setup Wizard (see the section in this document titled “Option A: OpenLM Agent Setup Wizard Installation” ), through silent installation (see the section in this document titled “Option B: OpenLM Agent Silent Installation”), or with Microsoft System Center Configuration Manager (see the section in this document titled “Option C: Open Agent Installation with SCCM”). B. In order to continue with the installation, click the “I Agree” radio button (see Figure 3). This will make the [Next] button active. Click [Next] to advance to the OpenLM Extensions screen (see Figure 4). Figure 5: Part 2 of the OpenLM Extensions screen. 5. Choose the desired extensions to install using option A, B or C below. 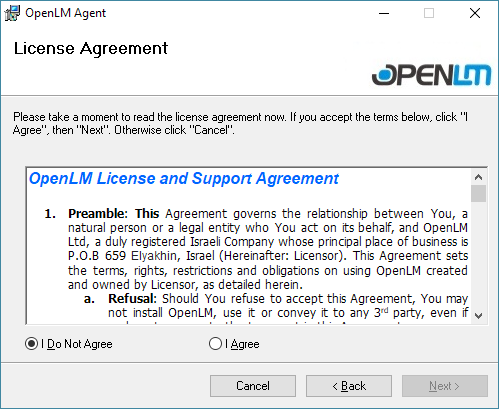 If OpenLM App Manager support is desired, choose option A. If monitoring without App Manager is desired, choose option B. If no additional services are desired, choose option C.
A. Click the “OpenLM App Manager” box to install the App Manager component Support. This will also check the “Install Service” item (see Figure 6). The OpenLM App Manager allows monitoring and control of enterprise software allocation policy. It also adds additional options to the OpenLM Agent Configuration screen (see Step #13). See the dedicated documentation for OpenLM App Manager (https://www.openlm.com/openlm-app-manager/). Services will need to be installed along with App Manager. Figure 6: OpenLM Extensions selection screen with OpenLM App Manager selected. B. Click only the “Install Service” box to install the service without App Manager component support. A service installation monitors OpenLM Agent and recreates processes in the event that they become unavailable. C. Leave both boxes unchecked to skip installation of service extensions. This option devotes fewer resources to system monitoring. 6. Click [Next] to reveal the Select Installation Folder screen (see Figure 7). This will populate with a default path for the installation. If you wish to change the path, click the [Browse…] button and select a new folder. [Disk Cost…] will display available drives and details such as the size of the drives and space available. Figure 7: The Select Installation Folder screen. 7. Click [Next] and the installation confirmation screen will appear (see Figure 8). Figure 8: The Installation Confirmation screen. 8. Click [Next] and the installation will begin. A screen will appear displaying a progress bar (see Figure 9). 9. When the software is installed the Agent Configuration screen will appear (see Figure 10). Figure 10: The Agent Configuration screen. 10. Check the installation options. It may be necessary to check with the system administrator to be sure the configuration options are correct. The default values are generally recommended unless there is a specific reason to alter them. The installation Language is English by default. OpenLM Server must have the correct server name. Check the SSL box if the network uses SSL security. The Port must match the OpenLM Server connection port. 11. Check the connectivity by clicking the [Check Connectivity to OpenLM Server] button. This should return a success message in the OpenLM Connection Check screen (see Figure 11). If the connection is not successful (see Figure 12), check to see that services are running (see the “Services Check” section later in this document), that there is a physical connection to the machine where OpenLM Server resides (e.g., that the server name and port are correct and functioning), and confirm installation options with the system administrator. 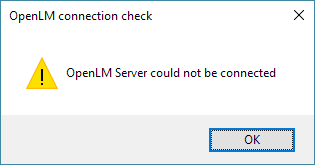 If you review the services and installation and still get an error, please contact OpenLM support (support@openlm.com). 12. 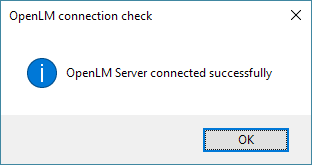 After receiving the success message on the OpenLM Connection Check screen, close the connection check screen by clicking [OK]. 13. 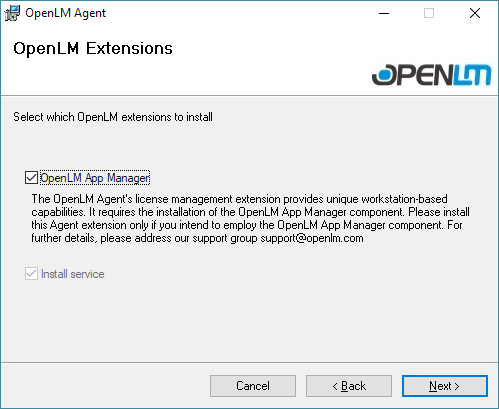 [Optional] If the OpenLM App Manager extension is installed, the OpenLM App Manager tab will be available at the top of the Agent Configuration screen. Click the tab name to reveal additional options (see Figure 13). 14. Check the License Manager options. It may be necessary to confirm settings with the system administrator. The default values are generally recommended unless there is a specific reason to alter them. The OpenLM License Manager Server must have the correct server name. The Port must match the OpenLM License Manager Server connection port. Use [Check Connectivity] to be sure the server connection is setup correctly and functioning. This should return a success screen (see the suggestions in Step #11 if the connection fails). 15. Click [Apply]. This will accept the Agent Configuration changes and close the screen. Figure 18: The installation success screen. 17. Click [Close] to exit this segment of the installation. At this point, the installation of OpenLM Agent is complete. See the dedicated end-user documentation to begin using the functionality (Introduction to Using OpenLM Agent). B. Launch the EXE directly by right-clicking (e.g., from C:\Windows\System32\cmd.exe) and choosing “Run as administrator” from the popup window. C. Navigate through the Start menu. Right-click on Start then choose Windows PowerShell (Admin). This will open the Windows PowerShell in administration mode. Figure 19: The Command Prompt screen in Administrator role. The MSI file path is the location of the MSI file downloaded for the installation. The parameters can be selected from the parameter tables (see the “Installation Parameters, Options, and Descriptions” section later in this document to define the desired parameters). 3. Press [Enter/Return] on the keyboard to launch the installation. At this point, the installation(s) will be complete. Please see the dedicated configuration documentation for more information on basic and advanced OpenLM Agent configurations (Configuring OpenLM Agent). 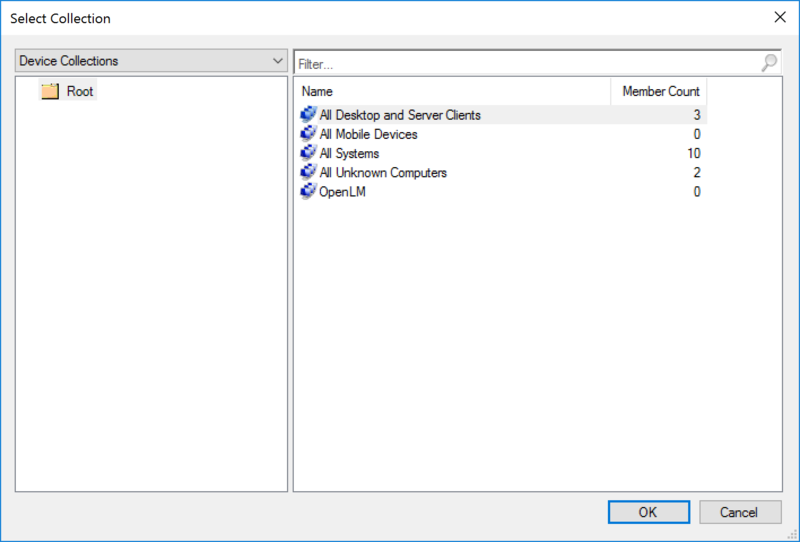 This installation method allows users to install OpenLM Agent with predefined options through the SCCM Configuration Management Console. The steps here are concerned only with the installation of OpenLM Agent. 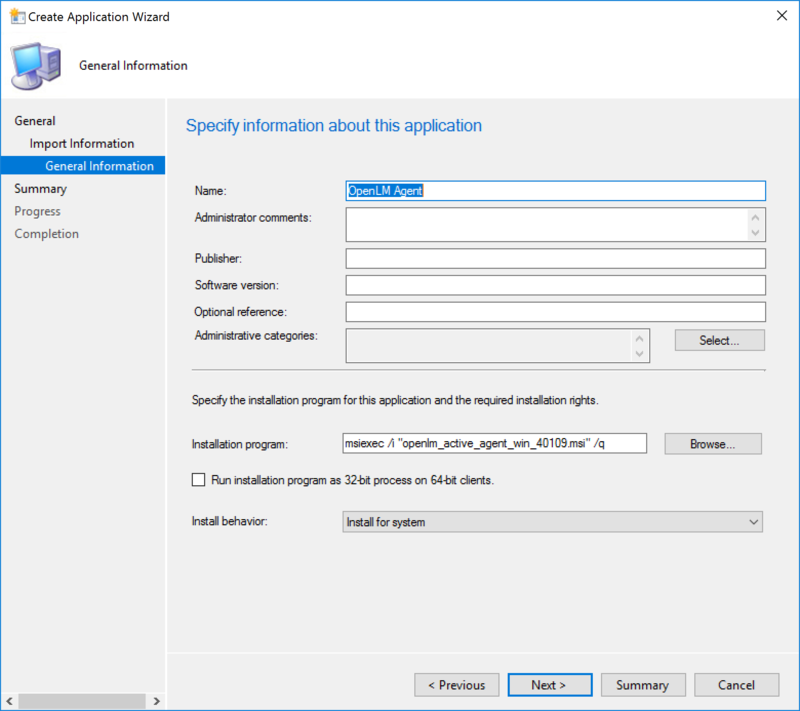 The instructions assume that there is already a working SCCM installation in your environment as well as on the workstations where OpenLM Agent will be deployed. It is advisable to seek IT department assistance with SCCM-related tasks. For additional information about SCCM and support of its installation and use beyond the instructions here, please consult with Microsoft Support (click here: System Center Configuration Manager). 1. 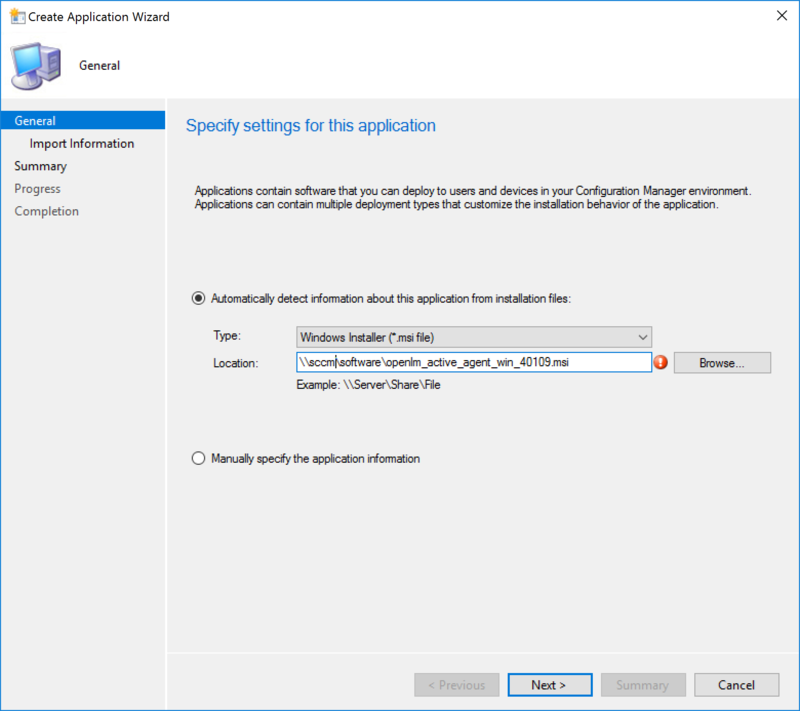 Locate the OpenLM Agent installer (openlm_active_agent_win_####.msi) on the SCCM server or on a network share to be sure it is accessible by that server. 2. Open the SCCM Configuration Management Console on the SCCM server. 3. Navigate to Applications in the Software Library menu at the left of the screen (Software Library > Overview > Application Management > Applications). 4. [Optional] A folder can be created under Applications to help manage organization of applications. This may be helpful in cases where it is an advantage to create applications for a variety of situations. To create a folder, right-click on Applications and choose “Folder” from the popup list. Enter the Folder Name in the Configurations Manager screen and click [OK]. Figure 20: The Create Application Wizard displaying the General panel. 6. Select “Automatically detect information about this application from the installation files” by clicking the radio button. This will use information from the installation files to automate the process of installation as much as possible. 7. Choose an installation file type. To do this, click the down arrow on the Type drop list and choose “Window Installer (*.msi)” by clicking on it. 8. Click on the [Browse] button to locate the MSI installation file identified in Step #1. 9. Click [Next] to advance to the ‘View Imported Information’ panel, which displays information automatically captured from the installer package. 10. Click [Next] to advance to the ‘Specify information about this application’ panel (see Figure 21). Figure 21: The “Specify information about this application” screen. 12. In the lower half of the panel, select an Install Behavior from the drop-down menu. Install for user — Installs using the rights of the current user. Install for system — Installs using the rights of the SMS Agent Host service (Local System account). Install for system if resource is a device; otherwise, install for user — If the application is targeted to a collection of devices, use install for system. 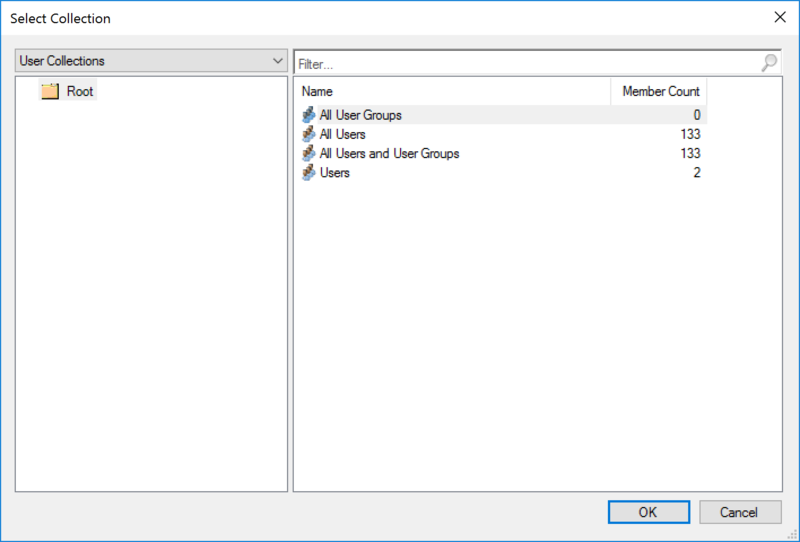 If the application is targeted to a collection of users or user groups, use install for user. 14. Click the [Next] button to advance to the Summary screen. 15. Review the information compiled for the application. If anything needs to be changed, use the [Previous] button to navigate back through the wizard screens; return to the Summary screen after completing changes. 16. When the compiled information has been reviewed, click on the [Next] button on the Summary screen. This accepts the changes and invokes a progress screen (see Figure 22) while the application is created. When the process is complete, the Completion screen will appear along with a review of the processing (see Figure 23). 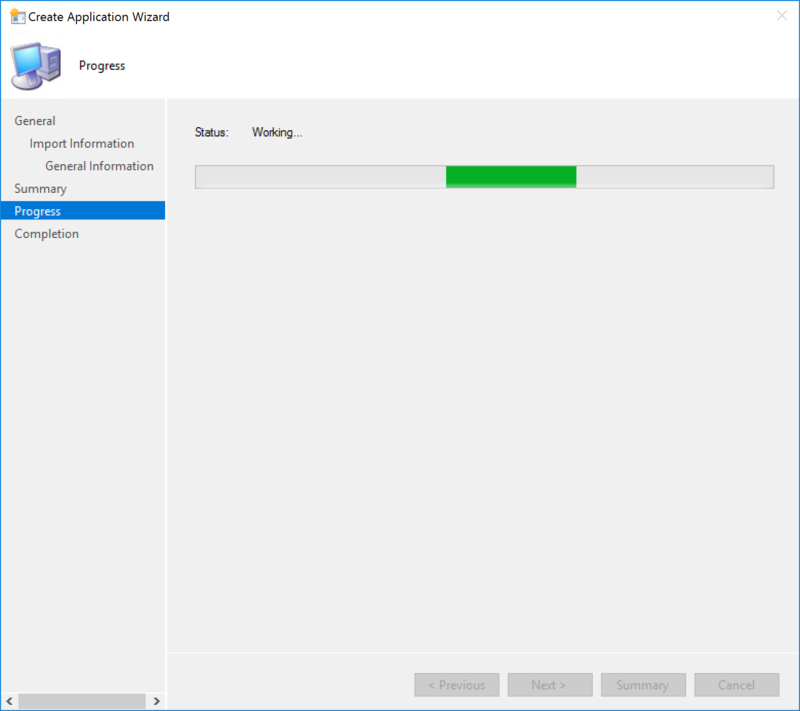 Figure 22: The “Create Application Wizard” progress screen. 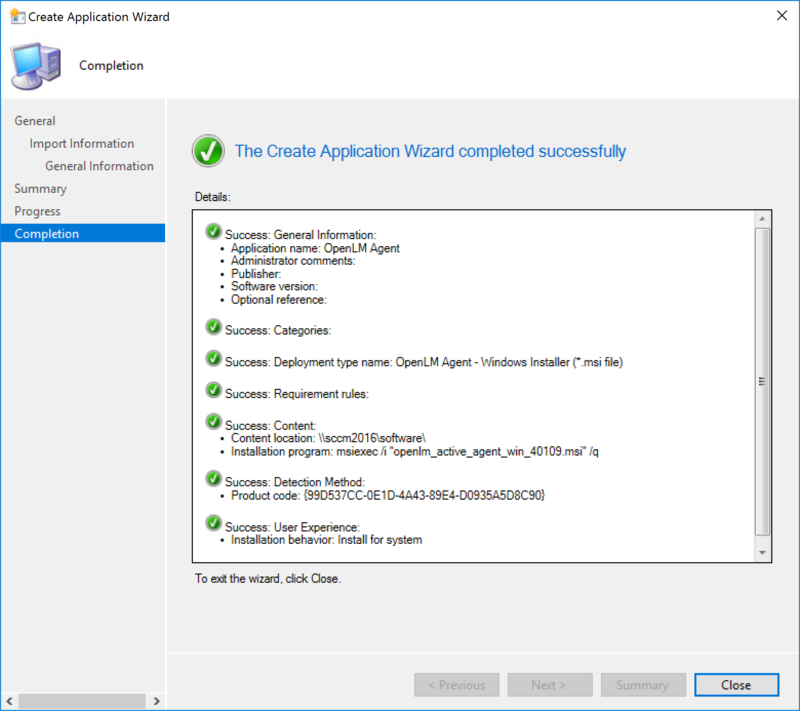 Figure 23: The “Create Application Wizard” success screen. 17. Click on [Close] to close the Completion screen and exit the wizard. 1. Open the SCCM console and locate the application in the listing under Software Library > Overview > Application Management > Applications. 2. 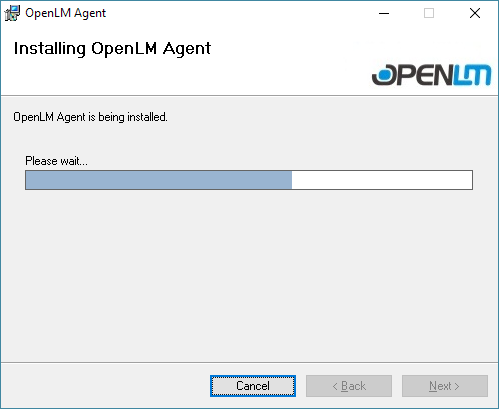 Right-click on the OpenLM Agent application and select “Deploy” from the popup menu that appears. 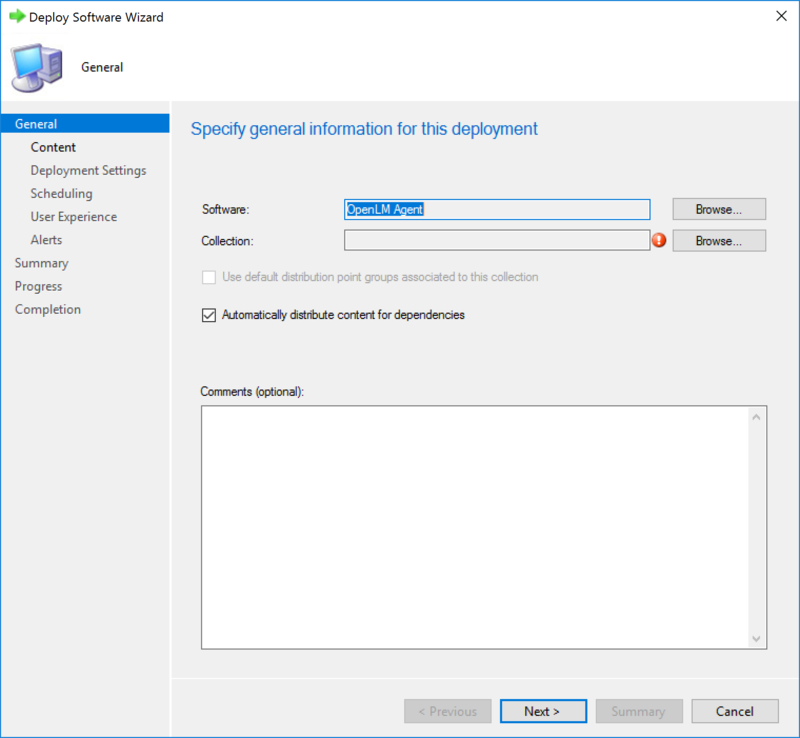 This opens the Deploy Software Wizard with the General screen displayed (panel titled “Specify General Information for this Deployment”). The Software field will be pre-populated with the application name (see Figure 24). Figure 24: The “Deploy Software Wizard” specify general information for this deployment screen. 3. Click the [Browse] button to the right of the Collection field and the Select Collections screen will appear. By default User collections screen is opened (Figure 25). Figure 25: The “Users Collections” panel on the Select Collection screen. 4. Use the drop list at the upper left of the Select Collections screen to navigate to User Collections, and choose from available options that appear at the right of the screen. 5. [Optional] Use the drop list at the upper left of the Select Collections screen to navigate to Device Collections, and choose from available options that appear at the right of the screen. Figure 25: The “Device Collections” panel on the Select Collection screen. 6. Click [OK] to accept the changes and return to the General screen. 7. Click [Next] on the General screen to advance to the Content screen (panel titled “Specify the Content Destination”). 8. Click [ADD] to open the popup menu and choose Distribution Points. Add distribution points by marking the checkboxes on the Add Distribution Points screen. 9. Click [OK] to return to the Content screen. 10. Click [Next] to advance to the Deployment Settings screen (panel titled “Specify Settings to Control How this Software is Deployed”). 11. The default values for Action and Purpose should be “Install” and “Required,” respectively. 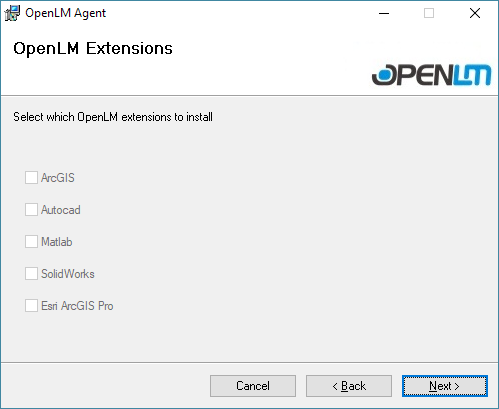 These options are suggested for OpenLM Agent installation. Click [Next] to advance to the Scheduling screen (panel title “Specify the Schedule for this Deployment). 12. [Optional] Use the options on the Scheduling screen to specify a time for installation. The default value of “As soon as possible after the available time” will launch the installation as soon as possible following completion of the deployment setup. 13. Click [Next] to advance to the User Experience screen (panel titled “Specify the user experience for the installation of the software on the selected devices”). 15. Click [Next] to advance to the Alerts screen (panel title “Specify Configuration Manager and Operation Manager alert options”). 17. Click [Next] to advance to the Summary screen (panel title “Confirm settings for the new deployment”). 18. Review the information compiled for the deployment. If anything needs to be changed, use the [Previous] button to navigate back through the wizard screens. Return to the Summary screen after completing any changes. 19. Click on the [Next] button on the Summary screen. This accepts the changes and initiates creation of the deployment. A progress screen will appear. When the process is complete, the Completion screen will display along with a review of the completed process. 20. Click [Close] to exit the wizard. This will return you to the console screen. 21. [Optional] Locate the deployment by clicking the Deployments tab at the bottom of the SCCM console screen with the application selected. 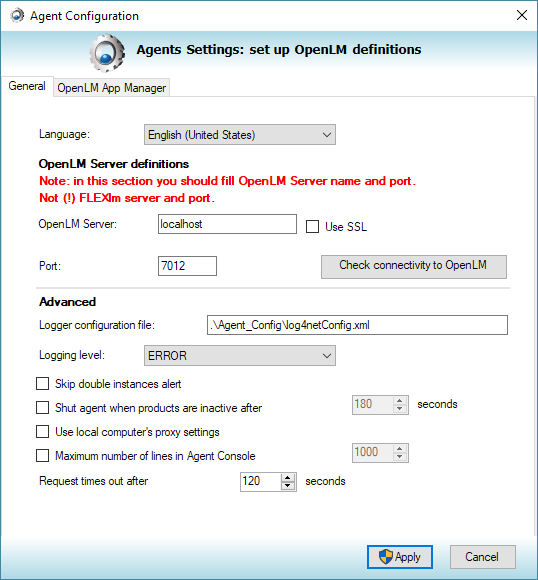 Upon successful deployment, the OpenLM Agent should appear in the Software Center on the client and will be installed automatically. These parameters help administrators control the installation options. The basic parameters for installation of OpenLM Agent are listed in Table 1: Command Parameters. These apply changes that affect OpenLM Agent software directly rather than the extensions. SERVERNAME localhost Use the actual OpenLM server name. SERVERPORT 7012 Use the actual OpenLM server port number. false true False: hides the OpenLM Agent icon from the user (not recommended). True : Show the notification icon at the taskbar. C:\Program Files\OpenLM\OpenLM Agent Specifies the root destination directory for the installation. false false True: Shutdown the Active Agent automatically when the inactive for a period of time defined in the INACTIVITY_TIME parameter. REQUEST_TIMEOUT 120 seconds The timeout for an OpenLM Server request the OpenLM Agent. Customers using ‘Suspend and Resume’ to FlexLM controlled applications may want to consider extending the default. OpenLM Extensions are software modules that enable OpenLM to retrieve idle licenses through the “Save and Close” method. Additional information on OpenLM extensions can be found on the OpenLM website (click here: OpenLM Extensions). Parameters and values for installation during silent installation are listed in Table 2: OpenLM Agent Extension Parameters. 1: Install 1 Relevant to ArcGIS users only. Allows selection of ArcInfo, ArcEditor, or ArcView license levels. OpenLM Proactie Application Manager helps manage the process of drawing licenses. For more information, see the dedicated documentation on the website (click here: Proactive Application Manager documentation). The parameters in Table 3: Proactive License Manager Extension Parameters list options for controlling these capabilities through silent installation. PRODUCTS_XML_PATH \\ServerName\Shared folder\OpenLM\products.xml C:\Program Files (x86)\OpenLM\OpenLM Agent\products.xml Enables centralizing the location of a products.xml file which stores OpenLM Agent proactive application management information.Use a local or UNC path. UNC_USER_NAME Username of authorized to (read/write) the products.xml file. UNC_PASSWORD Password of the UNC_USER_NAME username. Table 3: Proactive License Manager Extension Parameters. The following examples are intended to be guidelines to possible real-world scenarios that may help users select and configure installations for their own needs. They are not intended to be suggested configurations. The ‘####’ string in each example represents the version number of the installer which is subject to change. Install OpenLM Agent on OpenLM Server ‘olm_server,’ whose server port 7777. Set the language to German. Set the logging level to ALL. 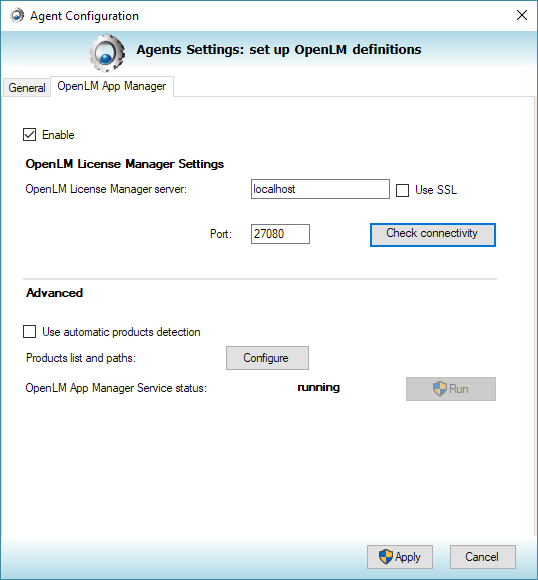 Install OpenLM Agent on the ‘localhost’ machine. Shutdown active license use automatically when an application is inactive for 20 minutes. Specify the root destination directory for the installation to be “D:\program files\OpenLM\OpenLM Agent.” Install the AutoCad, ArcGIS and Matlab extensions. You will need to be sure all of the necessary OpenLM components are running before attempting to use the module. 1. Open Windows Services (e.g., execute C:\WINDOWS\system32\services.msc or type “Services” in the Windows search on the taskbar and choose the Services App from the result). 2. Be sure that OpenLM Software Locker is running. 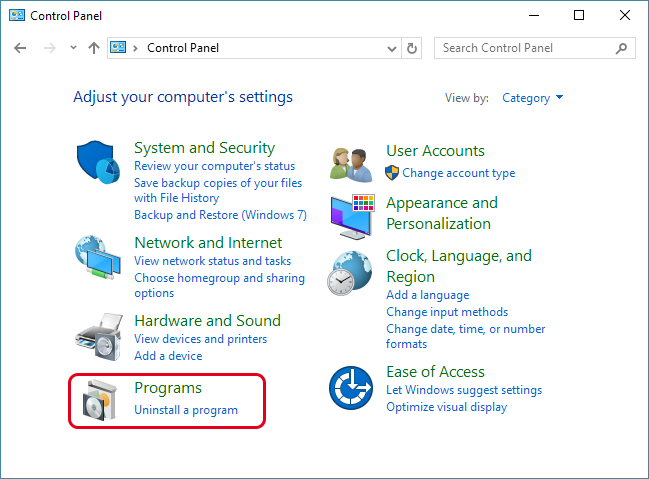 If the service is not running, right click the service name in the Windows Services screen and choose “Start” from the pop-up menu. 3. When the service has been started, close the Services window by clicking the [X] in the upper right of the screen. When it is confirmed that the service is running, it is possible to check the server connection. Uninstall can be initiated through the Windows Control panel (Option A) or by launching the OpenLM Agent Setup Wizard and choosing the option to Remove OpenLM Agent (Option B). 1. Open the Windows Control Panel. This is located at C:\Windows\System32\control.exe or by typing “Control Panel” in the Windows search bar and selecting “Control Panel” from the results. 2. 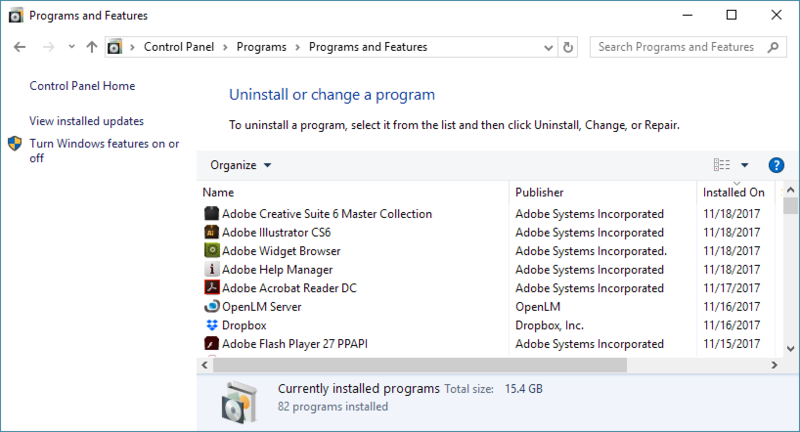 Locate and click the “Uninstall a Program” option under Programs highlighted in Figure 26. The Programs and Features screen will appear (see Figure 27). Figure 27: The Programs and Features screen. 3. Locate OpenLM Agent in the list of names (click on Name to sort the list alphabetically). Options will appear at the top of the list for possible actions (see Figure 28). Figure 28: The Programs and Features screen with the options highlighted. 4. Click on Uninstall. This will open a confirmation screen (see Figure 29). 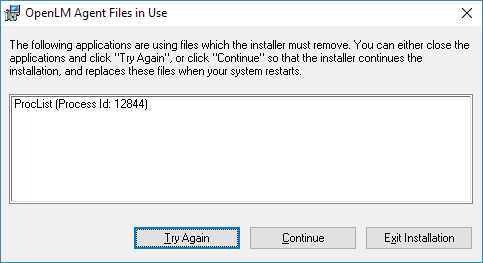 Figure 29: The Uninstall confirmation screen. 5. Click [Yes] to confirm the uninstall. A progress screen will appear (see Figure 30). The progress screen will close when the process is complete. 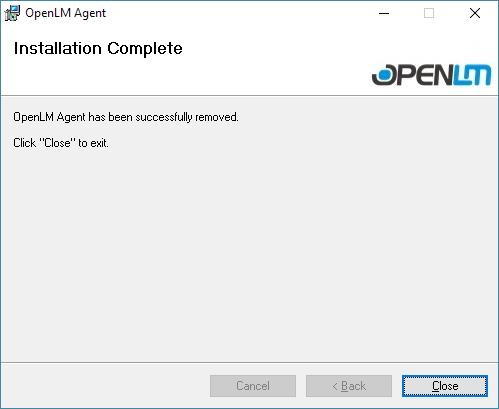 Figure 30: The OpenLM Agent uninstall progress screen. 6. Close the Programs and Features screen by clicking the [x] in the upper right of the window to close out of the Control Panel. 1. Locate the installer file and double-click the installer file or right-click and choose “install” from the pop-up menu. 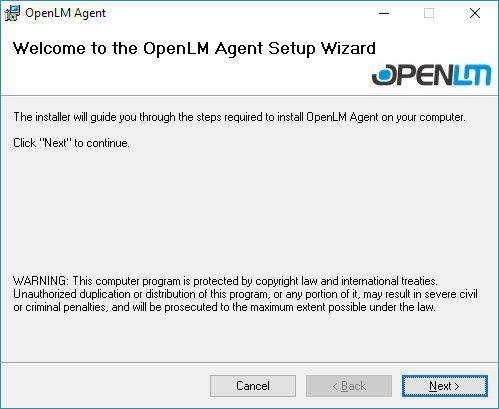 The OpenLM Agent Setup Wizard screen will appear (see Figure 31). 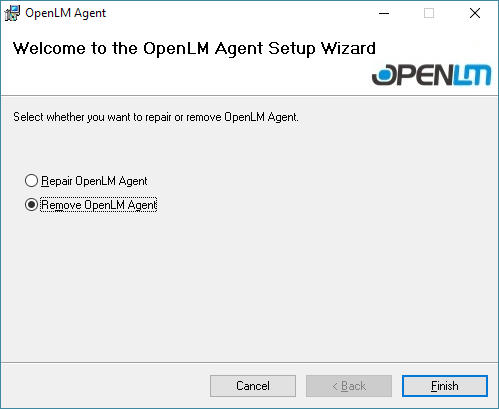 “Repair OpenLM Agent” is selected by default. Figure 31: The OpenLM Agent Setup Wizard screen. 2. 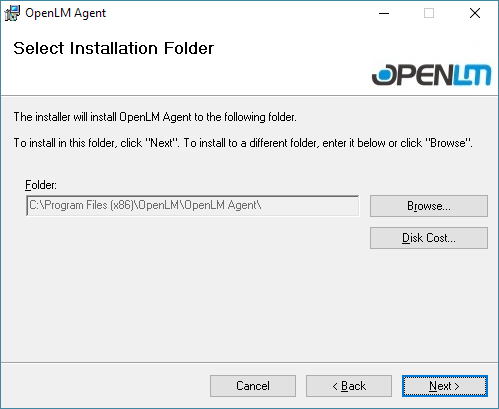 Click the Remove OpenLM Agent radio button to select the process for removing the installation (see Figure 32). Figure 32: The Setup Wizard with “Remove OpenLM Agent” selected. 3. Click the [Finish] button to initiate the process. A progress screen will appear (see Figure 33). Figure 33: The Removing OpenLM Agent progress screen. 4. If any processes are still running that use portions of the OpenLM Agent and Custom Commands, an error screen will appear with information as to the specific process(es) involved. These processes can be stopped using Windows Services (e.g., execute C:\WINDOWS\system32\services.msc or type “Services” in the Windows search on the taskbar and choose the Services App from the result), and the removal can be continued by clicking [Try Again] (see Figure 34). When the removal is complete, the removal success screen will appear (see Figure 35). Figure 34: The Files in Use alert screen. Figure 35: The removal success screen. 5. Click the [Close] button to exit the Setup Wizard. At this point the removal process is complete. 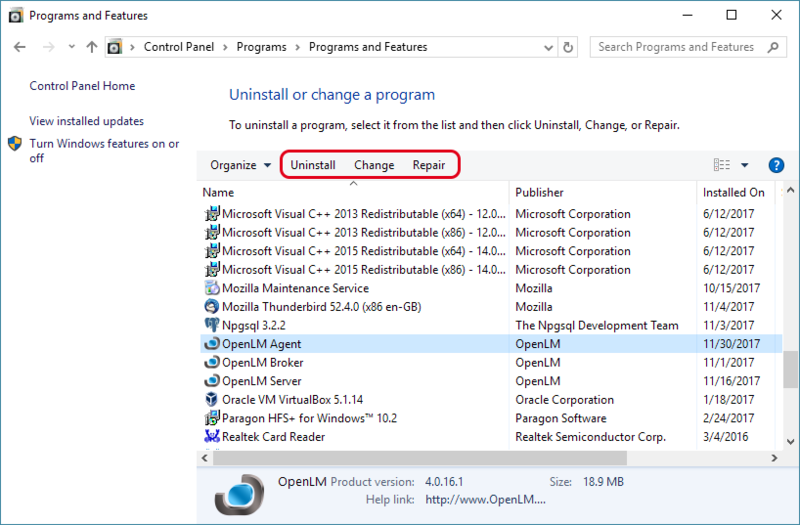 Uninstalling will leave the configuration files for OpenLM Agent intact and these must be deleted manually. They are left so that the OpenLM Agent can be reinstalled without losing previous configurations. They can be found by default in C:\Program Files (x86)\OpenLM\OpenLM Agent.